DNSDICT6 Tool Tutorial: Hacking is always fun but only if you know what to do. Available websites typically only teach basic or simple novice level skills. We are the only website which provides elite level tutorials and concepts. To strengthen our name, we are starting a sub-level campaign KYB (Know your Backtrack) under BEHC (Born Ethical Hackers Club) campaign. In the KYB campaign, we will teach all the Backtrack Hacking Tools available to hackers. This is the first tutorial in the series. Today we will learn DNSDICT6 Hacking Tool. Let’s begin. 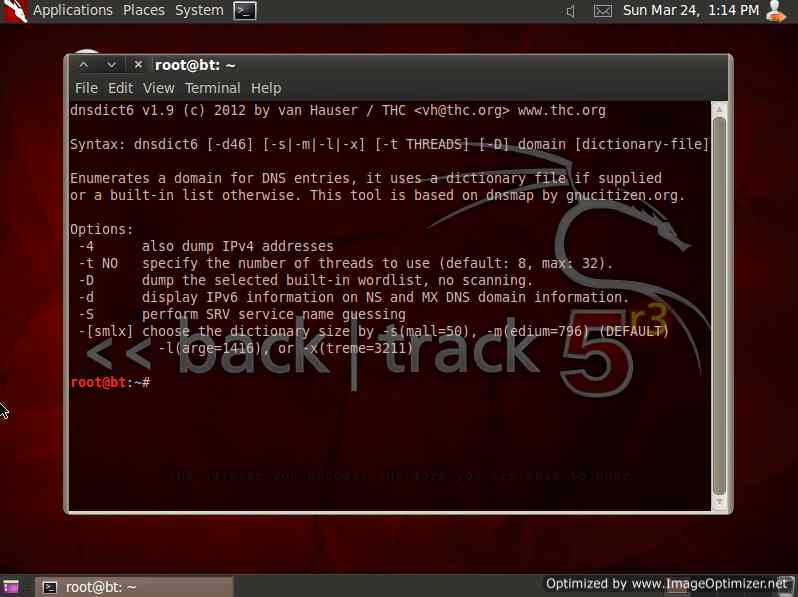 DNSDICT6 is an information gathering tool provided with Backtrack. This tool is used to find all the sub-domains of a website or web server. The most advanced use of DSNDICT6 is to enumerate all IPv4 and IPv6 addresses and extract the dumps like sub-domains and IP information. This tool is quite a powerful tool because it also extracts those subdomains which are restricted or invisible for users. -4 is used to dump IPv4 addresses. There are four types of dictionary which are already inbuilt in this tool. -s(mall=50), -m(edium=796) (DEFAULT) -l(arge=1416), or -x(treme=3211). -t is used to specify no. of threads. dnsdict6 -d46 -x -s -t 10 google.com ( This will extract all the sub-domains of Google with their IPv4 and IPv6 information). Now let’s learn how to use DNSDICT6. 1. First of all, start your Backtrack Linux. Now we have multiple ways to start DNSDICT6. b. Open the terminal and type DNSDICT6 to open the tool. The above snapshot shows the basic structure of DNSDICT6 syntax and parameters that we can use on it. The above command will enumerate all IPv4 and IPv6 information of all sub-domains of google.com. -s will perform service guessing, and 20 is the number of threads running simultaneously to achieve it. Now for advanced usage, we can also incorporate the dictionary in our DNSDICT6 command. First of all, we need to locate the dictionary file. If you don’t have one, create a sample dictionary file on your Virtual Machine Backtrack Desktop, calling the file name dictionary.txt on your desktop. The dictionary based attack is also known as DNSDICT6 Dictionary Brute force attack. This extracts only the information that we wish to extract. It’s the best attack option, but for this, we need to make our dictionary more powerful. There are several hacking database dictionaries available online. You can give them a try. That’s all about DNSDICT6 Information Gathering Tool. We hope you all appreciate Hackingloops BEHC campaign and its sub campaign KYB (Know Your Backtrack). If you have any queries or doubts, ask us in the form of comments. Sir Lokesh, I’d like to know how to create the dictionary file for example! Thanks for you great hacking technique training sir! Its quite easy to create dictionary files. Its a simple txt file. There are multiple ways for doing it like download existing dictionary files from online resources, second you can use tools to create custom dictionary txt file for you.